Description: New EMD at the fueling racks in CN's Johnston Yard. Description: Finally caught one of the new EMD's at the racks in Johnston Yard. Description: The new EMD's are extremly rare on the Gulf Division. Description: I finally caught one of the SD70M-2's. Here she is at the fueling racks in Johnston Yard. Description: Title says it all. Description: Amtrak and a CN freight wait for a clear signal at Manchac Pass, La. A crew had been working on the drawbridge, necessitating the delay. Description: CN 107 crossing the intersection of Vandorf and Woodbine Ave. Title: CN 8822 as the mid-train DPU. Description: Note the light rear marker light. 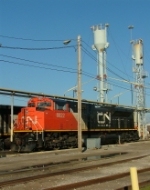 Title: CN 8822 with 149 at Mile 260 Kingston Sub. Description: CN 8822, with mixed freight in tow, charges west past waiting covered hoppers at Lapeer Grain. Description: CN 8822 leads a westbound freight through Imlay City in a rain shower. Description: CN/IC Southbound Intermodal Train Q194 ( Chicago, Illinois to New Orleans, La. ) passing through Wakeland, Ms. Description: CN/IC Southbound Intermodal Train Q194 ( Chicago, Illinois to New Orleans, La. ) passing through Bee Lake, Ms. Description: CN/IC Southbound Intermodal Train Q194 ( Chicago, Illinois to New Orleans, La. ) passing through Philipp, Ms.